When the first local asparagus of the season arrives in the market, I’m so eager for the fresh taste of spring that I prepare them as simply as possible. A few minutes on the grill or steamer, a drizzle of good olive oil, and a little salt and pepper are all that’s required for a feast. By now, though, I’m ready to experiment. This year my focus is asparagus and eggs, a traditional French combination. The classic poached egg over asparagus wouldn’t work, since I can’t bear even the sight of runny yolks. (There go my foodie credentials!) So I decided to substitute softly scrambled eggs as a suitably delicate complement to the grassy spears. The inspiration for this dish is a flan in Jacques PÃ©pin’s capstone cookbook, “Essential PÃ©pin” (Houghton Mifflin Harcourt, 2011). If your idea of a flan is a sweet Spanish custard, you’re in for a surprise. This version is more like an easy Gallic version of fritatta. This one pan dish is perfect for a spring brunch but works just as well for dinner with a green salad and some crusty bread on the side. The eggs are cooked on top of the stove just until they begin to set. Then the skillet is shoved into the oven for 10 minutes to finish cooking and brown. Fresh parsley, basil and garlic pump up the spring flavors. The chopped hazelnuts sprinkled over the top before baking are my way of trying to capture the nutty character the French achieve with browned butter. 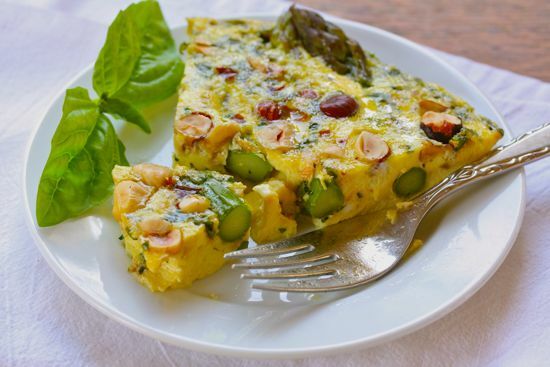 The concept may sound a bit odd but the combination of soft eggs, barely tender asparagus and crunchy nuts is as delightful as it is unexpected. Asparagus doesn’t get much better. Bring about 1/2 inch of water to a boil in a 10-inch nonstick skillet. Lay asparagus stalks in a single layer in the skillet and blanch for about 3 minutes. Drain the asparagus in a colander and rinse with cold water to stop them cooking. 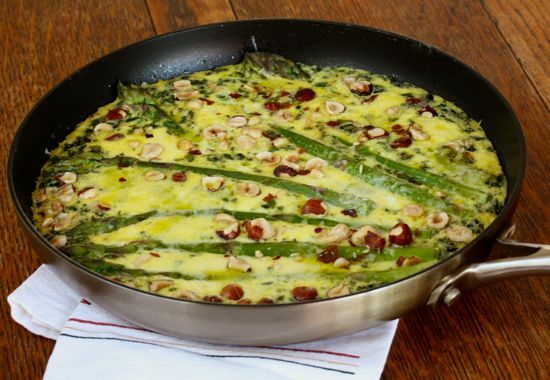 Set asparagus aside and wipe out the skillet. In the same pan, warm the olive oil over medium heat. Add parsley, basil and garlic and saute a few minutes. until garlic is softened but not browned. Meanwhile, beat the eggs with cream, salt and pepper in a medium bowl. Add the beaten eggs to the sauteed herbs and cook, stirring, for about a minute, just until the eggs set and soft curds begin to form. Remove skillet from the heat and arrange asparagus atop the egg mixture. Sprinkle with Parmesan and hazelnuts. Place pan in the oven and bake for about 10 minutes, until the eggs have set completely and the top is lightly browned. Serve flan warm or at room temperature.